On April 15th, Bengalis around the world celebrated the start of a new year 1425 in the Bengali lunisolar calendar. Some historians state that the history of this special calendar dates back to the 15th Century during Mughal reign of the Bengal region. In those days, agricultural taxes were collected according to the Islamic calendar. But the Islamic calendar was lunar and it didn't coincide with the harvest which made it difficult for the farmers as they had to pay out of season. To make things simple, Mughal Emperor Akbar commissioned his Royal Astronomer Fathullah Shiraz to combine the lunar Islamic calendar and the solar hindu calendar to make a harvest calendar. Thus began the start of Bangla New Year (Noboborsho) celebrations and festivities on the first day of the first Bengali month 'Boishakh' (Pohela Boishakh) that continues to this day! 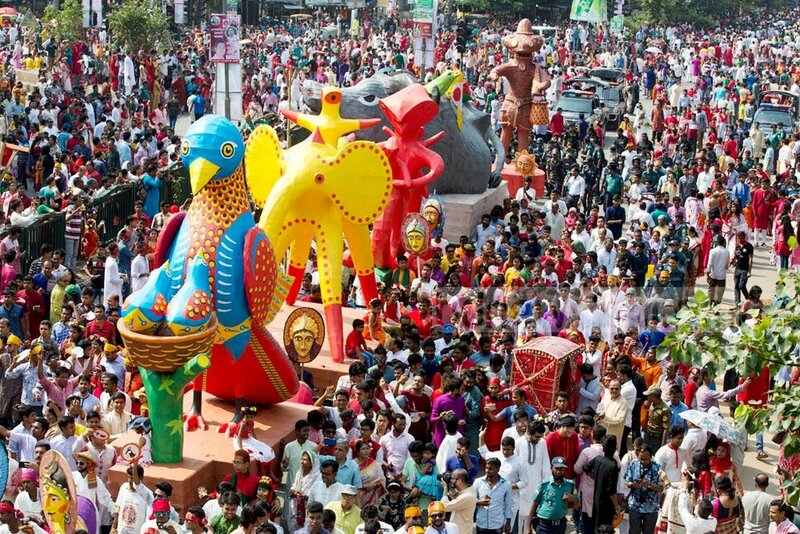 Bangladeshis all over the country come out in huge numbers to celebrate Pohela Boishakh on April 14th of every year, a day that is also marked as a government holiday. In Dhaka, thousands of people take part in the "Mongol Shobhajatra" festival, an event organized by the students and teachers of Dhaka University's Faculty of Fine Arts. The procession was first organized in 1989 by the University Faculty in order to symbolize peace and unity regardless of religion, gender, class, or age. The most fun feature of the processions are the giant, colorful, masks and representations of animals! In 2016, UNESCO declared this event as Intangible Cultural Heritage of Humanity. 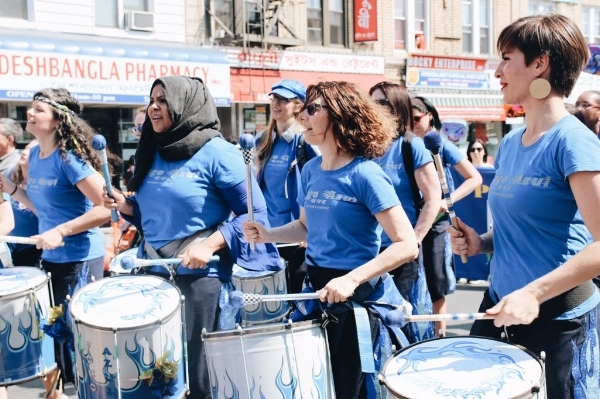 Kensington, a diverse neighbourhood of Brooklyn, NY, was the setting for a most beautiful Noboborsho celebration this year, complete with face painting, hues of red, colorful masks and an all female samba drumline! Who could ask for more? Check out the details of the festivities in this wonderful article here. 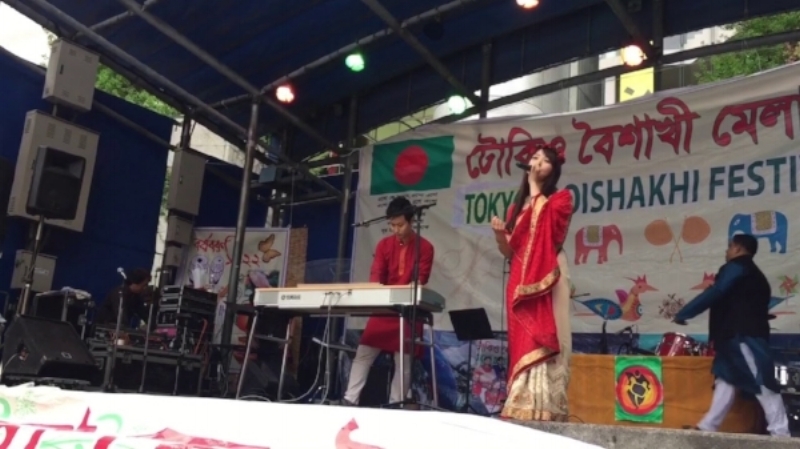 Hosted by the Japan Bangladesh Society, The 19th Bangladeshi Boishakhi Mela and Curry Festival attracted a crowd of almost 12000 people to the Ikebukuro Nishiguchi Park on April 15th in Tokyo. Bangladeshi expats living in Japan and Japanese locals enjoyed the cultural programs and delicious food vendors offering curry and other Bangladeshi food. The Sydney Boishakhi Mela is a lavish affair with live entertainment, fireworks, theatrical performances and lots of food and handicraft stalls! What started as a small cultural event with just a few Bangladeshis in Australia has now become one of the biggest Bengali events outside of Bangladesh, attracting crowds of up to 20,000 people. Check out their epic promo video for the 2018 festival here! 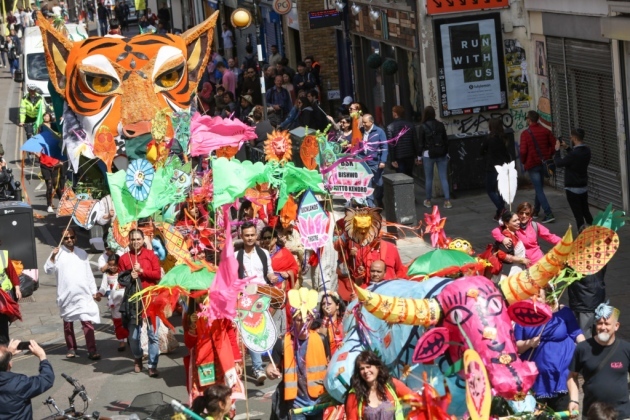 Last, but not least, the Tower Hamlets Boishakhi Mela is possibly the biggest Bengali festival outside South Asia. The 2018 festival date is set for July 1st and it is expected to be a grand affair, with famous musicians (rock band Miles performed last year), children's cultural programs, colorful processions and tons of fun and free activities. The 2017 festival crowd size was more than 40,000 people! Wherever you are in the world, we wish you a Happy New Year 1425!